David Schecter of Monstrous Movie Music at: http://www.mmmrecordings.com/ has put out another wonderful CD full of rare tracks. I am a big fan of his CD's and own all but one at this point. You can't go wrong with these CD's. You may be wondering what "The Blob" is doing on this site about Japanese music. The reason is that Track 29 is a library cue writtten by Roger Roger entitled "Dreaming Awake," and it's heard at the beginning and end of "THE GREEN SLIME". Since "The Green Slime" is a Japanese movie I thought I'd include this CD here under Misc.. "The Green Slime" is also known as: Gamma sango uchu daisakusen (Japan), After the Destruction of Space Station Gamma: Big Military Operation, Battle Beyond the Stars , Death and the Green Slime, Fango verde, Il (Italy), Gamma #3 Big Military Space Operation and The Battle of Space Station Gamma. "The Blob" is one of my favorites from that era and as a youngster of 9 years old at the time saw it in a theater. It's also an early movie starring Steve McQueen who is among my favorite actors of all time. For a low budget movie it had great production values and decent special effects for it's time and holds up fairly well today. A few years ago I attended a Chiller Theatre convention in N.J. where I met the man who created the red stuff used in the movie for the blob and saw a sample. The CD itself is fully packed clocking in at 75:49 and you get your money's worth. 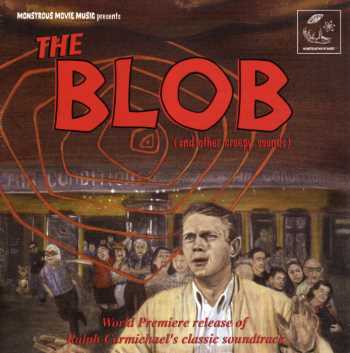 You get the novelty tune "The Blob" written by Burt Bacharach and Mack David before Burt Bacharach teamed up with Mack David's brother Hal and turned out many hits during the 1960's. The song is performed by studio musicians calling themselves The Five Blobs for this recording. The rest of the tracks from the movie are also a good listen. I really like the added tracks of music from The Valentino Production Music Library. You'll hear stuff there that has been used in many films. The CD also has a 13 page booklet with extensive liner notes about the tracks and movie.